The History of the Bradman Foundation | The International Cricket Hall of Fame. In my eyes the Bradman Trust has been created to honour and strengthen the game of cricket and my name is merely a catalyst to give it birth and life. I cannot do other than give it my blessing and express my sincere thanks to all the people who worked so hard to make this dream a reality. The Museum Complex is primarily for the youth of Australia. It is a symbol of what cricket has meant and will continue to mean to the people of our nation. In the twilight of a long and happy life I still think cricket is the finest character builder of all our sports. The Museum is a wonderful gift not only to the people of Australia but to cricket lovers everywhere. Without a doubt, the laws of cricket and the conduct of the game are a great example to the world. We should all be proud of this heritage. In the years ahead I trust that the museum, in its lovely setting, will encourage and inspire the young people of Australia to serve their nation with courage, honour and humility. The Bradman Museum Trust was established in 1987 with the goal to build and operate a museum celebrating Sir Donald Bradman. It was to be developed in the NSW town of Bowral, where he lived in his formative years. The organising committee was bound to a memorandum of association and constitution, with recognition as a not-for profit trust. The Australian Taxation Office granted tax deductibility status. Initially the plan was to develop an exhibition in the Bradman family home at 20 Glebe Street, which was purchased by the trust in 1988. After public consultation and Wingecarribee Shire Council approval it was decided to construct a purpose-built museum across the road from the house in public parkland adjacent to Bradman Oval. With the relocation came a broader vision to establish a cricket centre that conducted coaching clinics, encouraged cricket matches and developed educational scholarships. Sir Donald Bradman gave his full support to the project on the understanding the museum would celebrate the sport of cricket but not be limited to his own career. He attended the opening of the Bradman Pavilion in October 1989. At this time he donated several items from his personal cricket collection. The Bradman Trust operated the pavilion as a museum display while raising funds to begin the construction of the main buildings. By December 1990 major improvements had been made to the field of play and centre wicket square to allow the trust to host its first international cricket match and conduct coaching clinics. In 1992 the trust gained Sir Donald Bradman’s approval to register a range of Bradman-related names and images as trademarks in Australia. There was a developing need to protect Sir Donald’s name being exploited. This was extended to other cricket countries and has been expanded over the years. Sir Donald assigned all trademark rights of registration to the trust in 1994, allowing it to develop an income stream through royalties and licence agreements. Sir Donald was consulted on the style of product, because in most cases it would require him to sign the items and occasionally he agreed to include a photo in the marketing material. In 1994 the Bradman Trust commenced a restructuring process to create a more viable working organisation that better reflected its operation. In June 1994 the Bradman Foundation became the remodeled committee with a new constitution and reduced number of board members. It also sourced considerable capital input not related to the Bradman trademark. In August 1996 the main museum was opened, with progressive exhibition upgrades since. 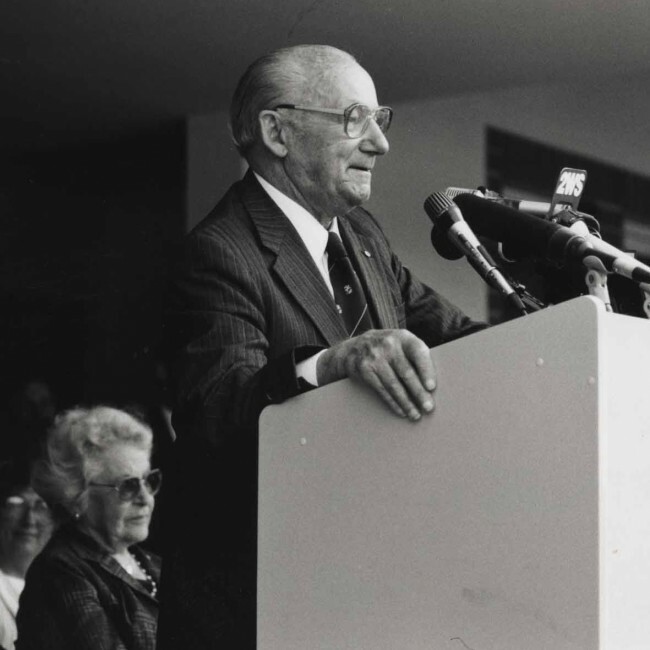 The foundation continued to operate the museum and its associated activities, including the Bradman Memorial Fund that was established with Cricket Australia and the Bradman family after Sir Donald’s passing in early 2001. That year the museum experienced an increase in income because of the tremendous public interest in Sir Donald’s death and through the sales of associated commemorative products. Between 2002 to 2010, the museum recorded a steady decline in visitor numbers. Similarly, the additional revenue derived from merchandising and royalties decreased. For the first time in many years, expenditure exceeded income and there was a need to establish new strategies to ensure the foundation’s long-term financial viability. The refreshed business plan provided the foundation with a timely opportunity to re-assess its operations. With Sir Donald Bradman’s death, declining visitation and income there was a need to refresh the organisation and museum content to reflect the game beyond the Bradman era. The foundation developed short and long term action plans to provide a direction of repositioning the museum which was aligned with an evolving global game. The Bradman Museum was well established and respected, therefore it was a natural progression to amend our collection policy to include international content – a vital step to keep the Bradman name relevant in today’s society. The Bradman Museum shall collect, conserve, research and exhibit Australia’s cricketing heritage on the world stage, in order to raise the public appreciation of the game and the impact it has had in the development on cricketing nations. The foundation’s objective shall be, as requested by Sir Donald Bradman, to promote cricket as a valuable cultural and sporting force within the community. Following the death of Sir Donald Bradman, the foundation works to expand its original brief from documenting and displaying Test cricket including the commemoration of one man. The museum will embrace cricket more widely, including all forms of the game, so that it continues to have meaning and relevance to contemporary society. The Bradman Foundation should aspire to become a truly national and ultimately, international organisation supporting the game of cricket. Its core asset will remain the Bradman Museum, however its activities need to become more wide ranging. The foundation will consider a re-branding of its galleries and related graphics to better illustrate the broader profile. This could include the development of a new website to take the museum beyond the physical location in Bowral. The foundation will expand its work through traveling exhibitions, curatorial expertise, cricket matches and events. Primary to the fruition of any of these activities will be the success of current and new fundraising initiatives. We want to make the Bradman Foundation one of the pre-eminent organisations in world cricket. The International Cricket Hall of Fame was opened in 2010, resulting is a 20 per cent increase in visitation and Bradman Oval-hosted international school visits and youth tournaments. The museum is an education centre and a valued ambassador for the game and the nation. The Bradman Museum & International Cricket Hall of Fame is global in its reach, connecting generations and cultures to honour and strengthen the game. Download above history in a pdf format here.